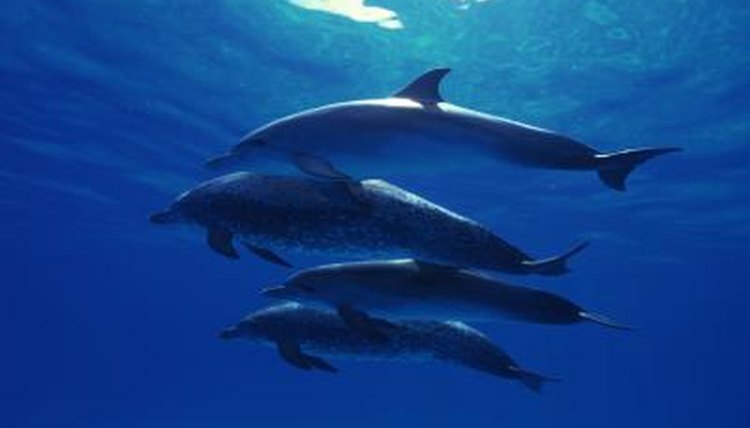 The Bahamas are not only known for sandy beaches and luxury resorts, but also as a habitat for various marine species. The country is made up of more than 700 islands that spread across more than 100,000 square miles of ocean. The third largest barrier reef in the world is located here, making it a haven for a diverse selection of marine life. Bahamian waters are populated by sea animals that include humpback whales, leatherback turtles, clown fish, green moray eels, barracudas and the placid nurse shark to name a few. The queen conch is one of the most iconic marine species of the Bahamas. A dietary staple and prized for their beautiful shells, the queen conch is a large gastropod mollusk, also known as a sea snail. Its external spiral shell is composed of calcium carbonate, which protects its soft body. The conch itself has eye stalks and long proboscis. It has a single foot, or claw, which it uses to propel itself. The conch population in the Bahamas is threatened due to overfishing. Conchs take as much as five years to reach reproductive age, and many are harvested before it has the opportunity to spawn. The Bahama sea star, also known as the cushion sea star, is a mollusk found among the coral reefs and sea grass marshes of the island nation. Growing up to 20 inches across, the color of this sea star species ranges from red to brown and is covered in knobby spines. The sea star feeds on sea urchins and sponges by enveloping them with its stomach that it pushes out from inside its body. The creature also feeds on algae and other decaying matter on the ocean floor. Nassau grouper calls the cracks and crevices of the Bahamas coral reef its home. The fish, a member of the sea bass family, is considered a delicacy and key part of many traditional dishes of the Bahamas. The Nassau grouper can grow up to 4 feet long and 40 pounds, but most specimens are 1 to 2 feet in length and weigh between 10 and 20 pounds. Mostly a solitary animal, the grouper rarely forms schools with other members of its species. When threatened, it camouflages itself among surrounding rocks and corals. The grouper has a symbiotic relationship with wrasse, a tiny fish that feeds on parasites and dead skin on the grouper's body. The wrasse will even clean the inside of the grouper's mouth without fear of being eaten. This widely distributed species is frequently found throughout the reefs of the Bahamas. The fish gets his name for the 20 or so spines that cover its body, when the fish is threatened it inhales water to expand its body like a balloon causing the spines to stick out. The fish dines on snails, sea urchins and hermit crabs with the use of its strong beak-like mouth.